It was an odd moment as TV news cameras took close-up shots of Becker exiting the Leaf and plugging the electric car into the new charge station as if he had just pulled up to The Leonardo in a spaceship. New as the technology is, Becker explained that these stations were just the latest additions to the city's electric-vehicle infrastructure. Currently, the city owns five level 2 charging stations that were installed in 2011 thanks to funding from a Utah Clean Cities grant and were recently upgraded by the city. The upgrades to the level 2 stations allow users to charge their vehicles for free, with a two-hour time limit and with a full charge taking anywhere between two to six hours. The two newly unveiled level 3 stations, located at 255 E. 500 South, adjacent to Library Square, are also currently free to use (a fee for use is still being determined) and take between 30 to 90 minutes to fully charge a battery. The new level 3 stations were donated by Nissan in coordination with the Utah Office of Energy Development. 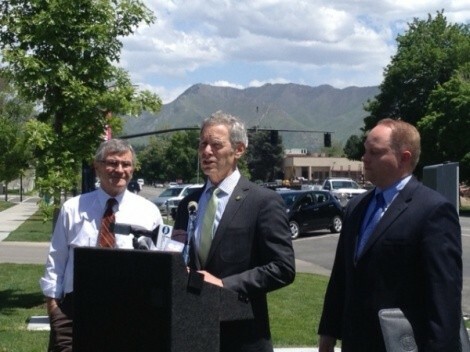 “It's really a good day for us in Salt Lake City as this is one of the many things we're doing to address air quality and provide for a much better energy future, and to save people money because the cost of running electric vehicles—once you pay the purchase price—really is significantly less,” than traditional vehicles, Becker said. Utah Clean Air Partnership Director Ted Wilson also hailed the historical weight of these new stations. While he considered the smooth drive over to the station in the Nissan Leaf to be like “driving silk” he described the vehicles as Model Ts of a new era. “When Henry Ford rolled out the Model T, everyone went, 'What?!' Then they back to their horse and buggy and drove away contented,” Wilson said, adding that it wasn't long before the new technology took hold everywhere. “That will happen with these cars,” he said. 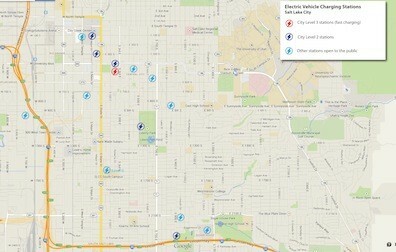 See below for a map of the city-owned and other publicly available charging stations.